Dr. Duncan attended NC State for her undergraduate degree in biological sciences. She received her Doctorate of Veterinary Medicine from Purdue University in 2005 and then practiced general medicine in Tampa, FL for 2½ years. While in general practice, she found that she had a special interest in the oral trauma and dental cases and pursued a dental residency. 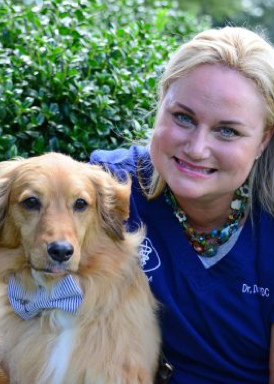 She completed a three-year dental residency program at the Animal Dental Centers of Baltimore and Annapolis, MD and became a board-certified veterinary dentist in 2014. Dr. Duncan joined Upstate Vet in April of 2013. Her special interests include involved oral surgeries (such as maxillectomies/mandibulectomies); endodontics (root canal therapies, vital pulp therapies); advanced surgical extractions; jaw fracture repairs; periodontal therapies (closed root planing/open root planing and bone grafting); and prosthodontics (composite restorations and placement of crowns). She also loves to share her knowledge of veterinary dentistry by giving lectures throughout the country to veterinary students, veterinary technicians, and other veterinarians. In her free time, Dr. Duncan enjoys traveling, stand-up paddle boarding, kayaking, going to the beach, going to the gym, volunteering for the community, and spending time with family and friends.